Well, from Stephenson, this is something completely unexpected and different: a light, comic, genre-bending (sci-fi & fantasy) novel that mixes quantum physics with computer science, magic, witchcraft, time travel, and parallel universes. If this sounds more than a bit like the set-up of Charles Stross’s “Laundry” novels, it is. 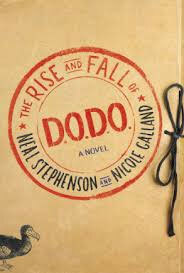 Another similarity is that the protagonists in both the Laundry Files novels and The Rise and Fall of D.O.D.O. work for super-secret government agencies dealing with the occult. There are, however, major differences between the Stross and Stephenson/Gallard novels. One is that the “Laundry” stories feature first-person narration from a single point of view, and The Rise and Fall of D.O.D.O. has first-person narration from eight p.ov. characters (four male, four female), and the story is told via journal entries, memos, historical documents, transcripted conversations, and e-mail exchanges. This sounds like it could be a mess, but it’s not: the story is quite easy to follow, which given the narrative complexity is no mean feat. All of the characters are well drawn, with distinctive behaviors, physical appearance, dress, speech patterns, writing styles, and personality quirks. Those characters range from the very sympathetic (Melisande, the primary character, and Tristan, the primary male character), to the utterly loathsome (Blevins, an abusive, puffed up hypocrite). The Rise and Fall of D.O.D.O. begins with a time-lock device: we learn from Melisande’s first journal entry that something has gone horribly wrong, and she’ll be stranded in 1851 unless she’s rescued within a few weeks. From there, the story unwinds detailing the development of D.O.D.O. (Department of Diachronic Operations) from its humble beginnings with Tristan, who works for the Department of Defense, recruiting Melisande, an ancient language expert, to work on a nascent time travel project. Following that, D.O.D.O mushrooms, with Tristan and Melisande quickly recruiting Frank, a physicist working in the area of (what else?) quantum physics, who creates a time travel machine in which witches can practice magic and send people back in time. Shortly, the DOD begins using the time machine to alter the past, and shortly after that the DOD official overseeing the project, General Frink, appoints a slimy, incompetent crony as its administrator in place of the competent Tristan. From there, several disasters ensue, ending with the time-lock situation (Melisande stranded in 1851) described at the beginning of the book. There’s no point in detailing the plot further, except to say that it makes sense as much as any time travel plot can make sense (ultimately, they don’t — they’re inescapably paradoxical). So, time travel is one of the book’s two “gimmes”; the other is the existence of magic and witchcraft. One very attractive feature of the book is that it has many genuinely funny moments, including a wonderful three-page passage on the reactions of surveillance personnel forced to watch the virtually nonstop sexual antics of two of the characters. This is the high, or at least the funniest, point in the interplay between the male and female characters, which is both amusing and believable throughout the book. If there’s any lesson to be drawn from The Rise and Fall of D.O.D.O., it’s that hierarchical institutions are inherently dangerous, in part because incompetents in command positions can and do make terrible decisions, overriding the concerns of the competent people beneath them. Other than that, The Rise and Fall of D.O.D.O. has no redeeming social value other than being for the most part — it’s a bit on the long side — highly entertaining. That’s more than enough to justify picking it up. Zeke Teflon is the author of Free Radicals: A Novel of Utopia and Dystopia (pdf sample here). He’s currently working on the sequel and on an unrelated sci-fi novel in his copious free time.